Jan 14 · Last update 16 days ago. Should coalition forces have acted differently in Libya? Eight years after the 2011 military intervention in Libya the country is still in a state of political and humanitarian disaster. The country remains split between two conflicting governments and various tribal militias, and amidst this chaos human trafficking and other human rights abuses have become commonplace. Was the extension of the intervention to topple Colonel Muammar Gaddafi a mistake? Should the NATO-led coalition acted differently in Libya? NATO should have extended the coalition’s mission, overseen credible elections and helped maintain peace while the foundations of Libyan democracy could be firmly put in place. The coalition being comprised of countries such as the US and the UK that were so deeply scarred by the failure of the 2003 invasion of Iraq, were reluctant to get to deeply involved in an occupation of Libya. As a result they left the country to establish its own government system fairly quickly, despite requests to stay longer from National Transitional Council Chairman Mustafa Abdul Jalil. Jalil requested further assistance from the NATO alliance in order to help deal with the massive amount of weapons and remaining Gaddafi loyalists in the country. However, following the withdrawal of NATO support, the interim government actually ended up utilising and paying militias to provide security instead of disarming them, worsening the current situation in the country. This led to widespread ongoing militia conflict, the likes of which the government and Gaddafi loyalists are still fighting over today, as well as Libya itself. The situation remains complex and violent, and would be arguably different had the NATO intervention been extended. If the coalition had not entered Libya or failed to extend the intervention to topple Muammar Gaddafi this authoritarian dictator would have carried on killing, torturing and oppressing the country. 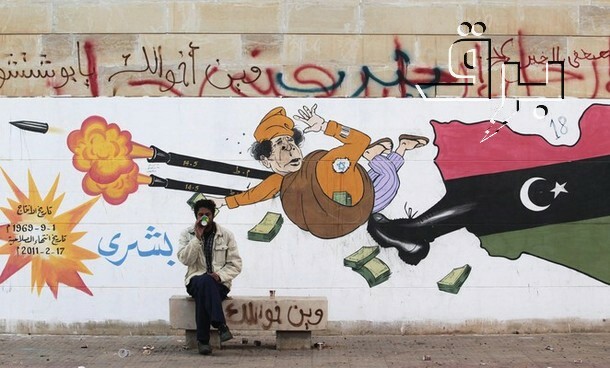 Gaddafi was responsible for wide spread violations of human rights in Libya and financing global terrorism, and civil unrest came from the inside of the country with the Arab Spring protests denouncing corruption and unemployment in the country. With this tyrannical despot deposed, at least the Libyan people have stepped toward democracy and self rule, and can begin to put their country back together. Comparisons of the post-intervention Libya to a fantasy, in which the country would naturally transition into a peaceful democracy naturally, without organically dealing with its violent social structure that Gaddafi had so long appeased, are naive. Likewise the brutal nature of present day Libya should not mean we forget the horrible crimes of Gaddafi either. Human rights abuses would have continued under Gaddafi, further human rights abuses do not make the country in a worse position, but present the possibility to change, something that was very impossible under Gaddafi. As the intervention failed to properly deal with destabilising tribal forces in the country, prolonging the intervention would only lead to further costs to the coalition countries, coalition forces should have therefore instigated a full scale invasion. The main reason toppling Gaddafi was so destabilising for the country was that “each militia, each religious community, each ethnic group rebels against the other, [making] every region ... a minefield” . NATO should have therefore extended the mission in Libya, which could have helped stop the interim government from utilising and paying militias, and instead could have disarmed them, although the Iraq invasion is often seen as a military disaster itself, it could have arguably been a more effective solution in Libya. The United States Institute of Peace (USIP), a US congress funded organisation aimed at building peace in situations of violent conflict, have been stationed in Libya since 2011 with the aim of building a foundation for peace in the country. USIP concentrate their efforts on conflict resolution, dialogue, and establishing the rule of law at local levels in Libya’s most conflict heavy regions. This however would have been more effectively achieved following a full military intervention with the overseeing of civilian elections and disarmament of local militias. The NATO-led coalition force that removed Colonel Muammar Gaddafi from power in Libya was illegal, neo-colonial and highly questionable. In 2011 congress rejected limited military involvement in Libya which went ahead regardless, with wide speculation from interested oil companies the claimed moral reasoning remains doubtful. Additionally, with the situation now ready to descend into full blown civil war eight years later, intervention was obviously only a mistake. The strained relationship between the United States and Gaddafi had long been maintained, dispute and pressured through oil companies. George W. Bush unexpectedly lifting sanctions on Libya in return for in creased oil production for US companies and a distraction from Iraq, and Gaddafi often threatening oil executives, such as ConocoPhillips CEO Jim Mulva, with reduced oil production in an effort to influence US policies. Libya, with its 8.7% GDP national budget surplus and 1.8 million barrels per day level of production in 2010, was arguably more profitable without Gaddafi’s influence over oil negotiations. In retrospect this is the most likely explanation for US actions in Libya and what has led to such a dire situation here. When then US President Barack Obama introduced the military mission in Libya he distinctly said “to include regime change would be a mistake” , this claim was echoed by many involved but despite this regime change was the outcome of the intervention. This led to a massive power vacuum in the country and Libya continues to be one of the least stable states in the world presently. Obama’s original words therefore still ring true, and only providing humanitarian aid as originally stated would have directed Libya to be much more stable in the present day. However evil a force Gaddafi represented in the country he was without doubt also a stabilising force also. It was a mistake of then Secretary of State Hilary Clinton to extend the intervention in Libya to include the toppling of Gaddafi, as mistake she obviously doesn’t recognise . However economically, politically and morally the NATO alliance should have stuck to their original intervention and not paved the way for increased violence, slavery, and later continued civil war. The international response to Libya in the last decade has been a continued failure that is being played out to suit various international needs while making the humanitarian situation in the country only worse. Recent international backing of forces opposed to the United Nations supported government in Libya is only continuing to destabilise the situation in the name of international concerns regarding oil and migrants. Furthermore when comparing the cost to the humanitarian threat in Libya you can see that the last decade of intervention in Libya was a waste of money, destabilising and a huge mistake in foreign policy. The UK Government Foreign Affairs Committee’s in depth investigation into the Libyan intervention has found that, just like Iraq, the threat Gaddafi posed to the people of Libya was overstated, and the investigations report criticised the UK’s role in the NATO intervention. The investigation even uncovered evidence of French intelligence stating France's motives were economic and political, and the likelihood of this being true of other nations is undeniable. The threat being exaggerated in this way makes the reasons for intervening in Libya morally corrupt and further underline the intervention as a mistake.